Jen of Use Real Butter gave us a wonderful challenge: make the dough for Chinese pot stickers and similar dumplings and then fill them with wonderful fillings. She started us off with a Shrimp filling and a Pork filling, plus the recipe and instructions for making the dough to wrap the filling in. She even included a link to a demo of how to shape them, including those darling pleats. You can see the family recipe here. One of the advantages of leaving the challenge to the posting day is that I was able to read tips from DCs who had already worked out some of the challenges. One had to do with dry dough. Jen's best tip was to weigh the flour because dry flour can vary in weight depending on how you scoop it into a measuring cup as well as, a little, on how damp a day it is. I weighed out a pound of all purpose flour and used just under 2/3 cup of warm water to make the dough. It was smooth and easy to work with a only a tiny bit sticky. Filling these little packets was fun if time consuming. For the filling I decided to go with the pork mixture, adapted slightly. I'll give the recipe below for filling and soup. Instead of boiling the finished packets in water and then using them for soup for tonight's dinner, I boiled them directly in the Asian flavored soup broth. Once the dumplings were cooked, I removed them to bowls and added julienned baby spinach, stirring it just for a minute until bright green. The broth with spinach was ladled over the dumplings and a few uncooked green onion slices scattered on top. It made a wonderful soup...very light but satisfying. The dumplings were flavorful and fresh tasting and so delightfully delicate. Once they were cooked I didn't really see the pleats that you can see when they are uncooked. This will be a recipe I'll cook again. Thank you Jen for a fantastic challenge! 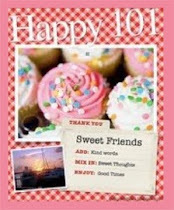 You also did an amazing job of answering questions, encouraging the cooks and making it all lots of fun. 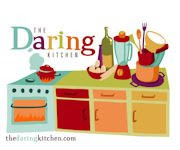 Go Daring Cooks! Mix all ingredients together until completely mixed. 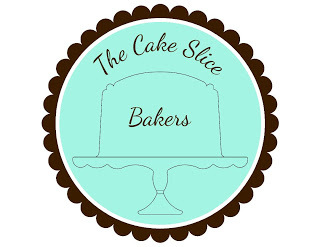 Cover with plastic wrap and keep cool while making and rolling the dough rounds. 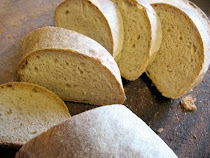 In a large bowl mix the flour with 1/4 cup of the water and stir until water is absorbed. 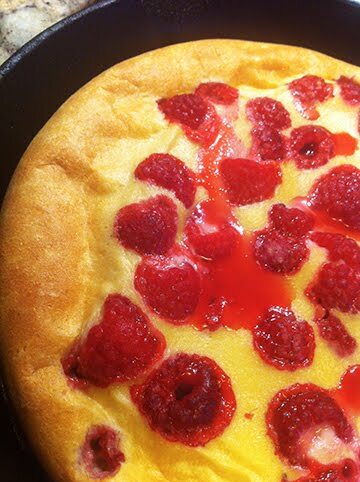 Continue adding water one tablespoon at a time, mixing thoroughly until dough pulls away from the sides of the bowl. We want a firm dough that is barely sticky to the touch. 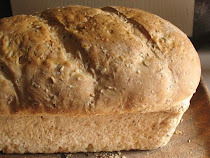 Knead the dough about twenty times, then cover with a damp towel for 15 minutes. Take the dough and form a flattened dome. Cut into strip about 1 1/2 to 2 inches wide. Shape strips into rounded long ropes. On a floured surface, cut the ropes into 3/4 inch pieces. Press palm down on each piece to form a flat circle. 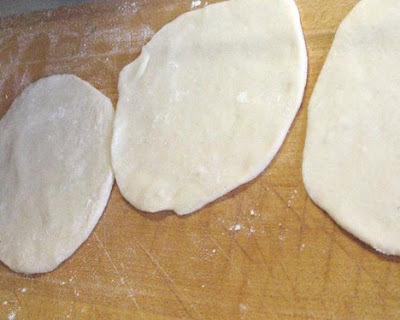 With a rolling pin, roll out a circular wrapper from each flat disc about 1/16th of an inch thick. Leave the centers slightly thicker than the edges. Pleat along an edge about 1/2 way around the edge, creating a sort of cup. Place the cup in the palm of your hand and place the filling in it. Bring the unfilled and unpleated side up and seal the edges. 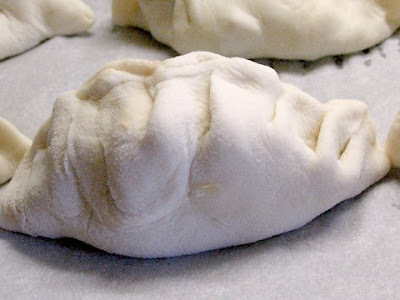 Keep all unused dough under a damp cloth. Bring the broth, soy sauce, ginger and onions to a boil. 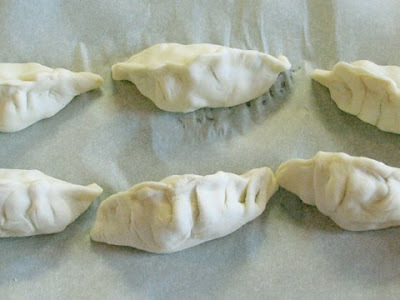 Drop in the dumplings and cook until the dumplings pop to the surface. 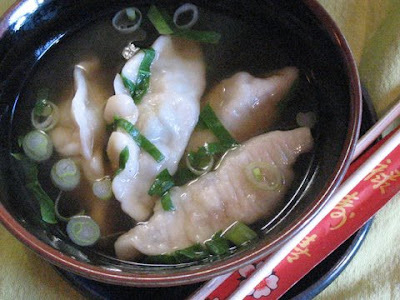 Remove cooked dumplings to soup bowls. You may want to cook the dumplings in batches. Once all of the dumplings are cooked, add the spinach and stir once. Let spinach cook just until bright green, about a minute. Ladle broth and spinach over the dumplings. If desired, garnish with a few uncooked green onion slices. Serve. Oh yum! I love how some of you Daring Cooks made dumpling soups. They look so awesome. Big thumbs up on your challenge - way to go! These look so yummy. :) I can eat a bowl without a doubt. Excellent job and a great idea to use them in soup! Your little pleats look perfect. It's a very fitting interlude for your holiday posts, as the Irish love their soup as well. 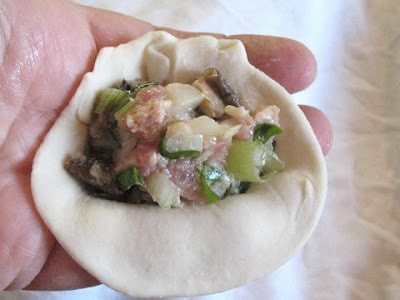 Great idea to make soup with the dumplings: thanks! Good job with the soup! It looks so glorious! I'm really impressed with your dumplings. I love that soup. Your dumplings really look terrific. May I have my bowl now. 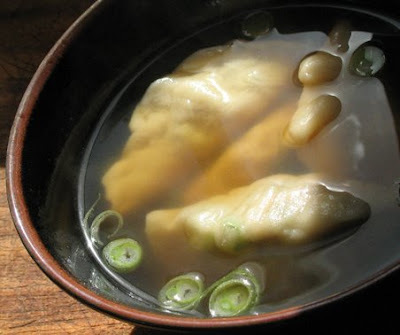 This is very similar to Chef Hiro Sone's recipe for Broiled Sake-Marinated Black Cod with Shrimp Dumplings in Shiso Broth minus the broiled black cod. Great work. Great idea, making soup and cooking them in the soup. These look so cute in the soup. Well done!